Leconfield village is located just North of Beverley and has retained the charm of a small village and the life associated with rural living. The site is a slim longitudinal shape and 8 new dwellings, juxtaposed to one another in a regulated format, have been designed. The style of dwellings is a clear stereotypical interpretation of the term cottage in scale, form, texture and materials; however the result is a truly inviting street scene that competes comfortably with the adjacent village church in architectural merit. Hornsea is a small seaside, located on the East coast just 20 minutes from Beverley. The site was formerly occupied by Hornsea Pottery who closed their manufacturing process and sold the site to a local developer. The irregular nature of the site resulted in a design that was linear with a central open space at its heart, and 50 new dwellings lining the arterial road that runs through the centre. 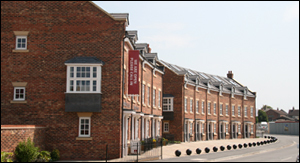 Located in the very heart of Beverley, the 130 new houses that make up St. Nicholasgate, form the residential component of the most important construction site in the town for many years. The residential development will be joined in the future by a commercial component, including retail space, a cinema, a multi-storey car park, hotel and the relocated East Riding College campus. The design brief that accompanied the Outline Planning Approval requested a clear route and visual contact with Beverley’s most imposing structure, The Minster. 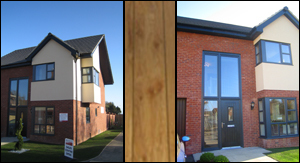 The architectural style, like many designs in Beverley, made a clear reference to its Georgian past resulting in a well-designed and aesthetically pleasing development that will blend harmoniously with the new commercial aspect of the site. Keldgate Bar occupied a prime site in the centre of the historic market town of Beverley and therefore demanded a design solution that would blend into the Georgian vernacular that surrounded it. The site included a number of bungalows and apartments that would be taken by a local Trust for the elderly members of the community. The build consisted of 8 apartments and 8 bungalows for the Trust, and 6 apartments and 20 houses for private sale by the developer. The design is primarily a homage to the Georgian period with well-proportioned windows, door surrounds and stone topped parapets; however there were certain opportunities, mainly to the rear elevations, to add a contemporary feel to the dwellings. Urban Sensation is located on Sculcoates Lane in Hull and is indisputably one the of the city’s more deprived and under-developed areas. The site was previously occupied by Needlers Sweet Factory and a power station; both of which had been redundant for many years. The client’s brief was to build 130 new contemporary homes that would encourage other development to take place and enhance the area for existing residents, including a large public open space and public artwork. The site was bisected by a large open watercourse which was traversed by a new curved pedestrian footbridge that allowed residents to pass freely. The choice of materials was considered alien at the time by many critics, however the blue bricks, render and aluminium windows give the site a contemporary feel which will age gracefully and, more importantly, reflect a period in time. Since completion the site has been included in the Conservation Area giving an indication of the quality of design and materials involved in the scheme. This site was formed from the sale of a collection of rear gardens and as a consequence there were a large number of trees on and around the site. One of the more important trees occupied a prime location in the centre of the site and required the dwelling to be designed around it. The resulting dwelling is curved around the tree in order to make best use of the land. Four new homes in excess of 2,000 sq.ft now occupy the site. 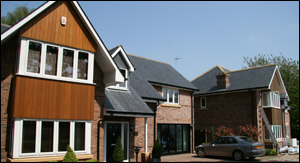 Manor Walk is at the heart of the affluent East Riding village of Swanland and was a site dominated by a belt of large spruce trees on two sides. The client’s brief for the design was clear in that the layout and styles of properties should blend effortlessly into the village in both architectural vernacular and scale. The site is dominated by a large blue spruce in the centre which became an opportunity to create an open grassed village space with 6 apartments and small cottages overlooking it. 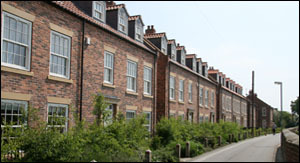 In addition to the cottages, there are also larger detached dwellings, creating a site of 31 new dwellings. Brookholme was the name of the large bungalow that occupied the site prior to its demolition, and the name has remained with the site during its construction and sale. 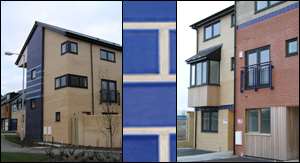 The site consists of 33 new homes comprising a mix of terraced, semi-detached and detached dwellings. The site is one of only a handful of developments in the Beverley area with a contemporary feel, incorporating large areas of glazing, corner windows, render finish and overhanging gables. Shepherd’s Well was a small site located at the foot of the Wolds in the rural village of South Cave. The key criteria that formulated the design was the presence of an existing beck that ran through the site, partly culverted and partly exposed. This was upgraded and incorporated into the layout to form a 2m wide natural feature. 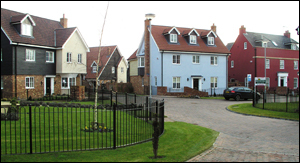 Architecturally, the design of the 23 new dwellings took inspiration of villages further afield than the East Riding as the palette of materials included tile hanging and render in red, blue and pale yellow. A curved block of terraced houses leading into the site is a beautifully aesthetic component rarely seen in new developments, and a credit to the developer. 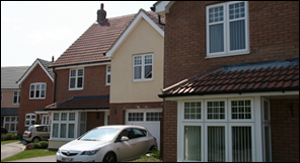 Some of the images shown on this website are taken from projects completed during other employment in the industry.